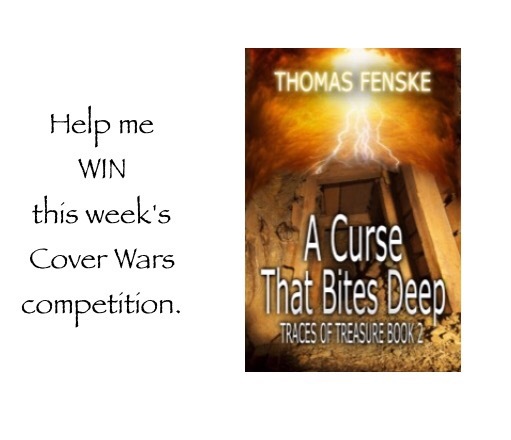 My latest novel, A CURSE THAT BITES DEEP is currently in a cover competition. I need your vote! Yeah, it’s a beauty pageant of sorts … or a popularity contest. I’m beating the bushes trying to get some votes. You can vote once a day. I’m really proud of this cover. I won this competition a while back for my first novel, and I want to repeat that success. So I need your help. It’s on a marketing site (Author Shout) that hosts this competition every week. All you have to do is cast your vote (hopefully) for A Curse That Bites Deep. You can vote once a day. Please do!! How about a new giveaway for the new year? These books follow the story of Sam Milton and are inspired by a Texas legend — you’ll find mystery, romance, danger, and a touch of the supernatural. … a riddle, an obsession, & a curse …what could possibly go wrong? More info on the books can be found at www.thefensk.com … there are giveaway links there too. Don’t forget to reblog! My last kindle edition giveaway was a bust so I’ve reworked it.